History: MBHPC is one of the oldest pony clubs in the U.S..
Pony Club originated in England in 1928 and was led by army officers trained at the Cavalry School at Weedon who were devoted to a system of schooling both the rider and the horse. The result was an emphasis on instruction, discipline, field and ring skills, horse management and a spirit of sportsmanship in competition that still continues today. In 1881, the Meadow Brook Hounds Hunt Club was established here on Long Island. 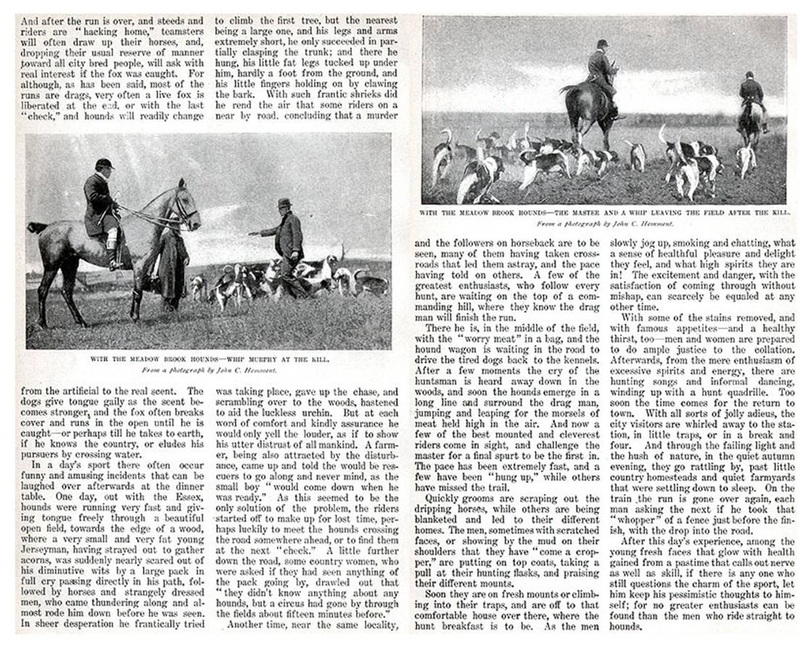 Later, the Masters of the Hunt founded the Meadow Brook Hounds Pony Club in 1955. The children in the MBHPC practiced the rules and objectives that had close ties to hunting. The Meadow Brook Hounds Pony Club was born when the Executive Hunt Committee of Meadow Brook Hounds composed of Jt. Master William Dobbs, Robert Winthrop, John Schiff, Frederick Pratt, Mrs. John J. McDonald, Mrs. James F. (Mouse) Cavanagh and Mrs. Joseph Merrill met together at the home of Jt. Master Charles Hickox. The worsening suburban conditions which had shrunk the once-vast hunting lands of Jamaica, Hicksville, Woodbury, Old Westbury, Glen Cove, Mineola and Huntington had now limited hunting to the north side of Jericho Turnpike. Farmers in the area who were sympathetic to the hunt were Ambrose Clark, John Schiff, Robert Winthrop and Sir Ashley Sparks. These gentlemen made their lands available to the hunt and pony club. Eventually, however, each succumbed to the encroachment of suburbia until only John Schiffs land remained. The Clark land became SUNY campus: the Whitney and Winthrop land became a golf course, Sir Ashely’s land was carved into housing lots: and the great Whitney stable became the architecture building for New York Institute of Technology. As all these lands were gobbled up, the future of riding became more oriented toward pony club, riding rings in back yards, horse shows instead of hunts, and trailering instead of hacking to meets. The tradition of pony club is carried on in the style of past Olympians who have risen from the ranks of Meadow Brook Hounds Pony Club. The Three-Day Event Gold Medalist Tad Coffin, as well as Olympians J. Michael Plumb, Don Sachey, and Bernie Traurig all were “A” Rated riders with the Meadow Brook Hounds Pony Club. It has been an exciting year! Meadow Brook Hounds Pony Club was represented at the Metropolitan Region Quiz Rally, Horseless Rally, Show Jumping Rally, Tetrathalon Rally and Dressage Rally. All teams placed well, had fun and learned from the experience. On the National level, four of our members qualified to represent the New York Metropolitan Region at the U.S. Pony Club National Championships in Lexington, Virginia. We are looking forward to many clinics and the Hunter Pace this fall. Our members can look forward to improving their skills in Pony Club Games, Dressage, Show Jumping, Cross Country, Polo and Western disciplines. Elsewhere in the country, pony clubbers enjoy and hold competitions in the disciplines of vaulting, games and polocrosse. Pony Clubbers learn about total horsemanship, not just riding. They find great rewards in team effort when competing in regional or national competitions. Pony Club is a family affair. We hope you will join our family. From: 1899 Munseys Magazine: "Riding To Hounds -- Meadow Brook Hunt Club, Long Island"